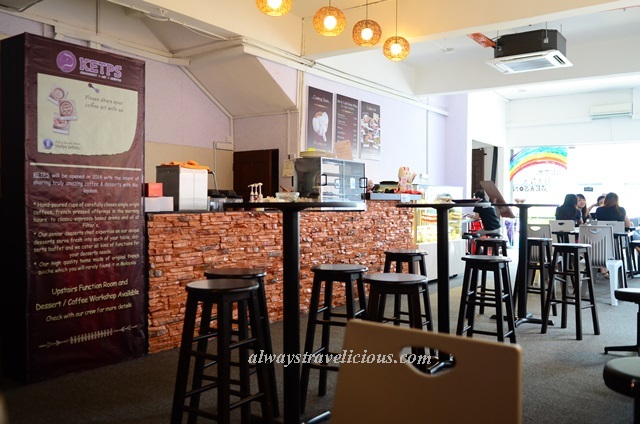 Ketps Cafe @ Ipoh, Malaysia - Always Travelicious ! Ketps is a cafe with almost 100 % emphasis on desserts and coffee. In addition, the coffee served are a bit more “engaging” with DIY coffee art and 3D coffee art. A lot of girls (and boys perhaps?) will be really excited to have a go at DIY coffee art and falling in love with the bubbly, foamy 3D characters. The desserts are pretty-looking with some creativity, but I am not too into them in terms of flavor. We took the set combo (RM 45), which includes one coffee for DIY art, one 3D coffee, two desserts and a complimentary mini tiramisu. The coffee for DIY art arrived “kosong”, with a white-foamed surface, and a small tub of melted chocolate with a tooth pick. So I had my very first go at coffee art, where I wrote “Hello There ! !” with my terrible “chocolate writing” using the tooth pick. The two little 3D piggies having a mud bath seemed to be enjoying themselves. I think the set combo is pricey, probably due to the 3D coffee. I had one in Cafe 55 in Penang and it was RM 15. Both desserts are well presented with a nouveau mix of ingredients. The mango mousse had peanut bits and an ooze of mango puree was hiding within which was a nice surprise. It was definitely eye-candy, but the mousse was heavy and I am not a big fan of the mango and peanut combo. The dense panna cotta was carried in a charming wine glass, in alternating layers of lychee jelly and panna cotta, which are essentially two items with mild flavors, and neither is making each other stand out. The tiramisu despite being complimentary, it was my favorite among all the desserts. Simple and classic. The chocolate sponge cake was moist, soaked in alcoholic liquor, topped with mascarpone cheese and cocoa powder. Overall the coffee was not bad; coffee art and 3D coffee was fun; and I expected more of Ketps’ desserts since coffee and desserts are their two only fortes.